Garry Tallent undoubtedly is best known as the bass player for the E Street Band, but in crafting his latest project To: Kate — A Benefit for Kate’s Sake, he assembled a cast of Nashville’s finest outsiders in order to raise funds for the Children’s Organ Transplant Association. In particular, Tallent is concerned about the fate of Kate Kirk, a 3-year-old who desperately needs a bone marrow transplant in order to avoid the fatal effects of Niemann-Pick Disease Type A/B. As a result, Tallent tapped many of his high-profile friends to perform on the endeavor. Indeed, only the Big Happy and Bob Delevante can be classified as unknown commodities, and they successfully hold their own against such luminaries of the Americana movement as Steve Earle, Jim Lauderdale, and John Prine. 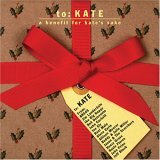 Unlike most Christmas-oriented compilations, the familiar fare on To: Kate — A Benefit for Kate’s Sake is delivered from a decidedly fresh perspective. BR549, for example, joyfully gallops through The Christmas Song; Jeff Black gives Winter Wonderland a soulful twist that blends Billy Joel with Ray Charles; and Jason & the Scorchers provides Oh! Holy Night with a punk-infused charge. Even better, the outing largely forsakes more traditional material in favor of original compositions and more obscure selections. Henry Gross of Sha Na Na fame explores a jangly, Byrds-ian groove on What a Christmas; Joe Ely gently waltzes through Bob Dylan’s Winterlude; and Rosie Flores bastes Christmas Everyday in a shimmering, horn-splattered arrangement that comes straight out of Motown. Granted, there’s nothing particularly earth-shattering among To: Kate — A Benefit for Kate’s Sake’s contents, but all in all, the effort is remarkably consistent and cohesive, and the proceeds that it generates certainly will be donated to a worthy cause.